At United Regional we treat a variety of elbow and shoulder conditions. These conditions are most often treated through surgical procedures and physical therapy programs. Surgical procedures and physical therapy may be recommended to treat the source of pain. 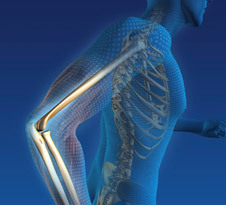 However, for more severe cases, a shoulder replacement may be required. Orthopedic surgeons at United Regional now offer a new surgical solution for patients who have significant pain and little or no movement in their shoulder. In a healthy shoulder, the upper arm bone (humerus) ends in a ball shape. This fits into a socket formed by the shoulder blade (scapula). Together the ball and socket form the shoulder. There are many medical conditions that prevent the shoulder joint from functioning normally. With the reverse shoulder replacement, the positions of the ball and socket are switched. The implant is designed so that the ball portion is attached to the scapula and the socket is placed at the upper end of the humerus. Reverse shoulder replacement surgery may help patients with rotator cuff arthropathy, a medical condition in which the rotator cuff muscles (the muscles around the shoulder joint) have torn to a point where they can no longer move the shoulder joint and allow it to function normally. Patients with shoulder weakness due to arthritis, a previous shoulder injury such as a shoulder fracture, rotator cuff tear and/or failed previous shoulder surgeries may also benefit from the reverse shoulder prosthesis.